The stress can mount to the point where your body starts to be affected, so it’s up to us to keep it at a minimum. This Gideon Cooling and Heating Ventilated Seat Cushion will, if nothing else, give your back a small reprise from the ever-mounting workload that gets stuck on your plate. This can heat up rumps when it’s cold out, or give a fresh breeze to backsides when it’s blazing hot. The 5-speed cooling fans are especially important to those who want to use this in their car with leather seats while wearing shorts in the Summer. 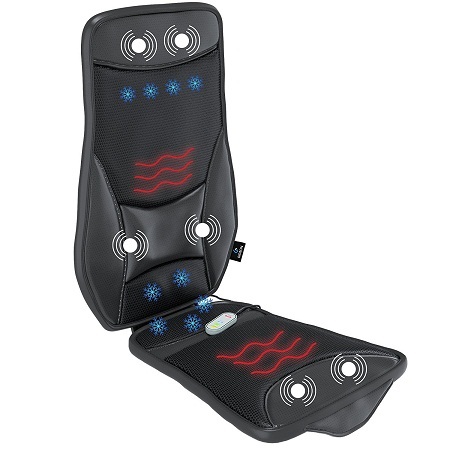 There are also 6 vibration settings that can be used in tandem with the heating or cooling to ease knots and tension. There’s a corded control keypad to select what features you want to experience, as well as a strapping system and no-slip backing to make sure it stays put when in use. This will plug into a wall plug or your DC car plug, and will cost you $49.95. The only hassle would be transporting it from home to car to office, but the benefits would likely be worth it when you need to make every moment of down time count.